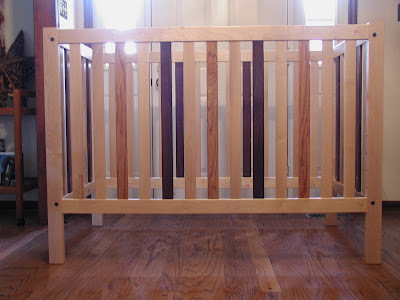 Today, Jannine sent me some great news -- Crib #2 is all done!!! 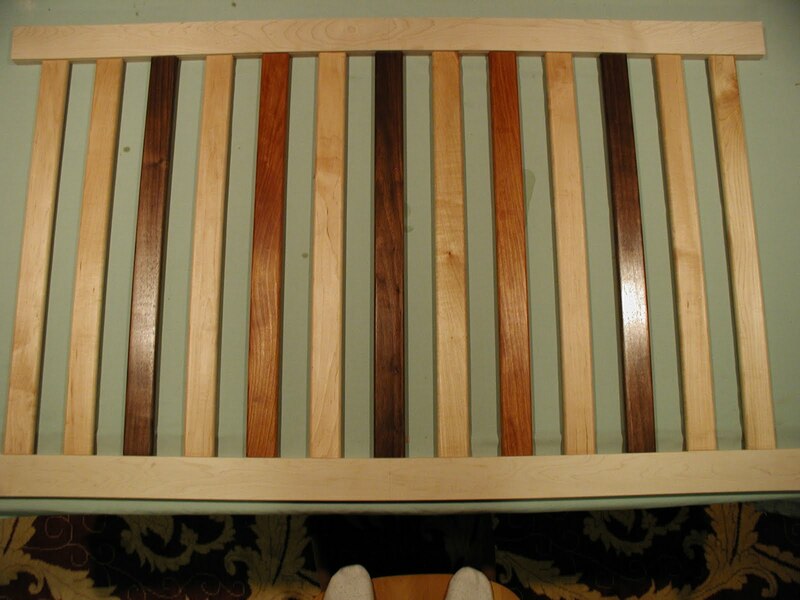 She also emailed me pix of it, which substitutes the cherry for red oak and switches the walnut for the cherry/red oak in the pattern, compared to Crib #1. Take a gander at its beauty! 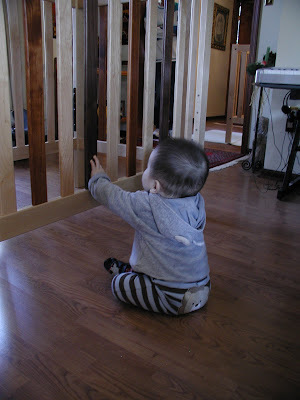 It just so happens that my parents had some friends over, who have recently adopted an adorable baby boy named Nouraiz. 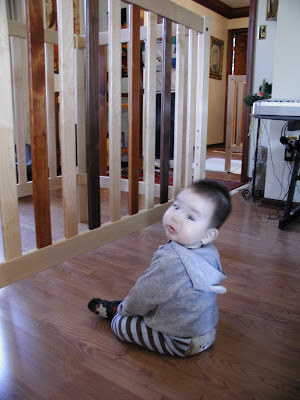 So, of course, the baby had to check the crib out to make sure it held up to baby expectations! The cribs will both arrive on Monday, delivered in person by my parents. They live 6 hours away, so this is nothing to sneeze at, but the cribs will be safe and they'll teach us how to set them up and move them properly. It'll be a good visit, but short, as my parents have to get home again to do all the things they've left undone in the several months they've been working their tails off making the cribs. They'll be back shortly after the babies are born to help out. Jannine sent me a picture last night of crib #1. It's GORGEOUS!! Crib #2 will be the same idea, just a slightly different pattern with the 3 woods. Crib #1 woods are walnut (dark), cherry (reddish), and maple. 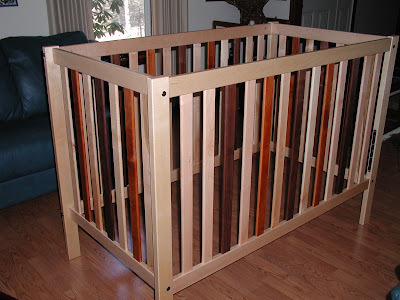 Crib #2 will be constructed of walnut, red oak, and maple. 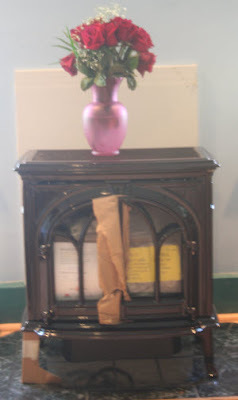 The walnut is from a supply from Jannine's dad, my Grandpa, who has been gone from us for about 11 years now. So that's kinda special. My Grandpa and Dad are both, obviously, woodworkers. Dad and Jannine made both of them by hand and we couldn't be more grateful. They are truly made with love (not to mention time, patience, talent, etc.). The cribs both convert to toddler beds (with three sides) and then to double beds, so the girls will be able to use them for years to come. We couldn't be more excited to welcome these particular pieces into our home. Truly beautiful heirlooms in the making! Dad and Jannine will be coming this Sunday to deliver the cribs. I'm 33w4d today and it's getting more and more "uncomfortable" (read: sometimes painful) to carry multiples. I still LOVE my big belly and I love feeling Lillian and Blair kick around in there, but there's almost no non-baby room left and sometimes their kicks aren't so much towards my belly as towards my ribs. Today, for instance, I've been on my laptop checking email and sitting slouched in my comfy chair. Well, the only place Lillian's feet fit anymore is right up in the right side of my rib cage. So there's this constant pressure there. Sometimes I push against her feet when they're lodged there, but I know there's really nowhere else for her to put them, so it's kind of futile. The nursery is coming together slowly, as I can only do a bit each day before my back or my pelvis starts to hurt. 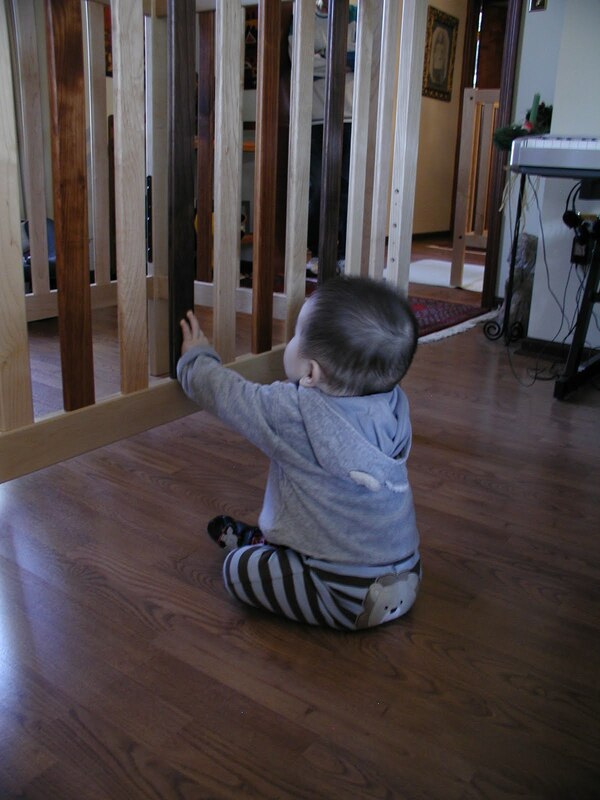 But I have assembled (and played with) the Chicco playard, so I know where all the connectors/parts of the bassinet and changing table and activity arch go. It's really a marvel of engineering! There's even a corner unit that provides a night light, vibrations and music (with volume control!). Over the course of a few days, I even decorated a trash can for the nursery with bunnies and little carrots on it. Paul and I also got curtains for that room and he put them up this past weekend, so that's all set. We just need a rug for the nursery and we'll be set. 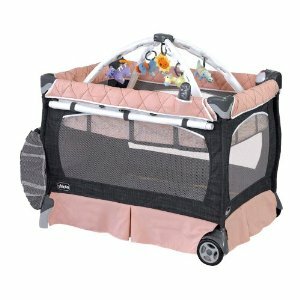 That and the cribs, which are arriving with my parents on Sunday. We simply cannot wait to see them!! All the love and hard work and looooooong hours that went into them will be appreciated every day the babies are in those cribs and afterward, when we convert the cribs to toddler and twin beds. We have our now-weekly OB/midwife meeting tomorrow. And on Thursday we have another ultrasound with our perinatologist, when we see the girls again and find out how much they weigh now. We'll keep you posted. 4 weeks ago (when I was 30w pregnant), Lillian weighed 2 lb 13 oz and Blair weighed 3 lbs even. My midwife, who works with my OB, gave me the thumbs up last week to go 50/50 on bedrest. That is, 50% of the time I'm awake, I'm allowed upright; the other half, I should be reclined. While this freedom definitely does my mindset good, the fact of the matter is that if I'm upright for half of my day, my back kills me. But it's all a matter of degrees. I guess I was on some kind of self-imposed bedrest before my late-December hospital stay anyway, because of the back pain. Paul picked up (with 2 nice coupons) our crib bedding sets the other night from Babies R Us (BRU). Now all the things we've gotten for gifts and picked up ourselves are just in the packaging in a spare room. Starting next Monday, we're getting the floors redone on the 2nd floor in the back section of our house (including the back room, which is the nursery). It'll look FANTASTIC when it's done (hopefully it won't take more than a week), but in the meantime, we can't set up any part of the nursery. It's an empty room with gorgeously painted light-mint-green walls (thanks to Paul, who painted the majority of the 2nd floor in November and December). 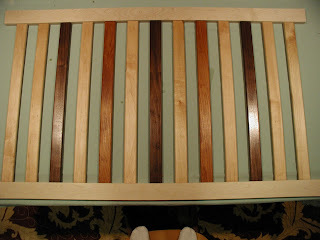 I can't believe how shiny that wood got with just tung oil! My dad did lots of research to make sure that both the wood and the finish he used would be safe for babies (especially when they teeth and could possibly chew on the rails, etc. ).